The Fylde Tramway Society ran a tour of the Blackpool Tramway system using heritage Twin Set 272+T2 on Saturday 29th December. 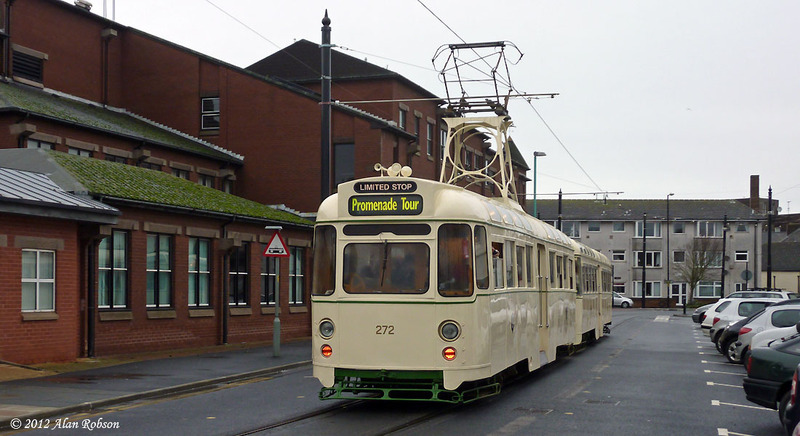 The trams were only permitted to stop at designated Heritage Tour tram stops, which limited the places that photo stops could be made. 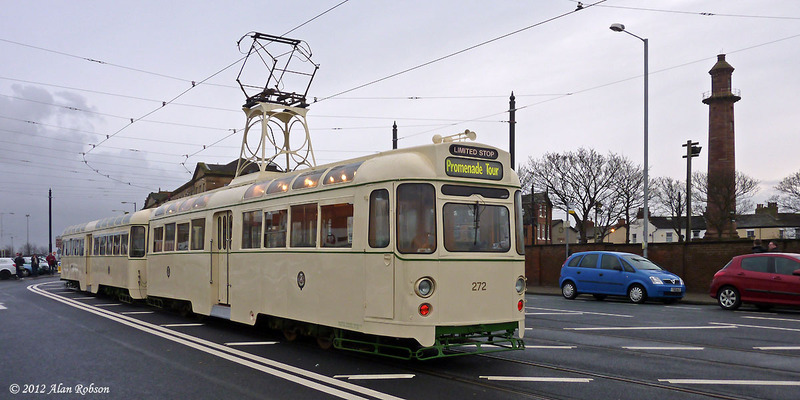 Midway through the tour an hour break was taken at Fleetwood, with the set laying over on the Ferry loop between 13:50 and 14:50. The following photos were all taken while 272+T2 was in Fleetwood mid-afternoon. 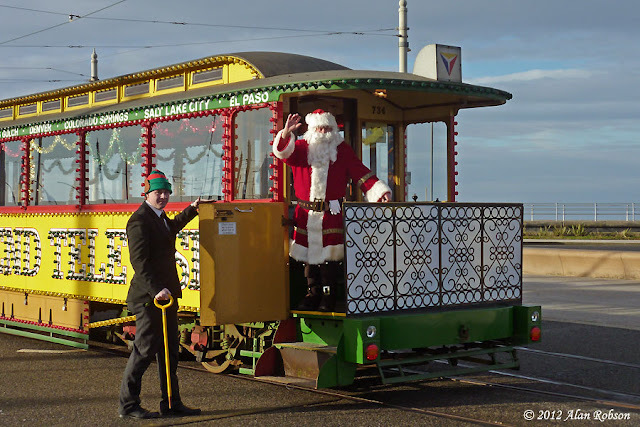 The last day of the Santa Express excursions was on Sunday 23rd of December. 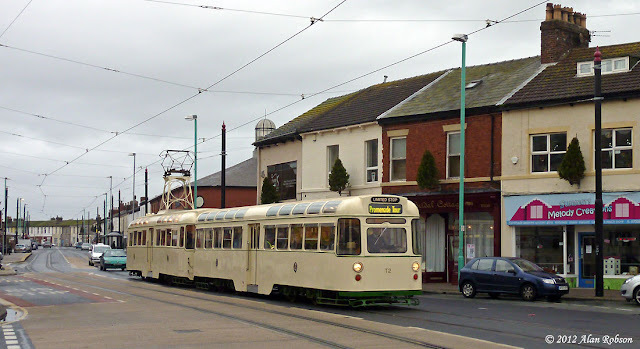 The 14:00 departure from the Pleasure Beach on the last day saw reasonable loadings of passengers riding the Western Train on its round trip to Little Bispham. 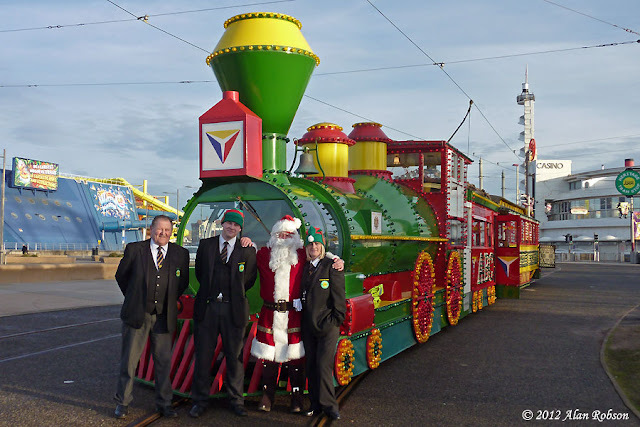 Hopefully the lessons learned during the three weekends of the Santa Express specials will see some improvement in the marketing and ticket arrangements, if similar specials are to planned for Christmas 2013. 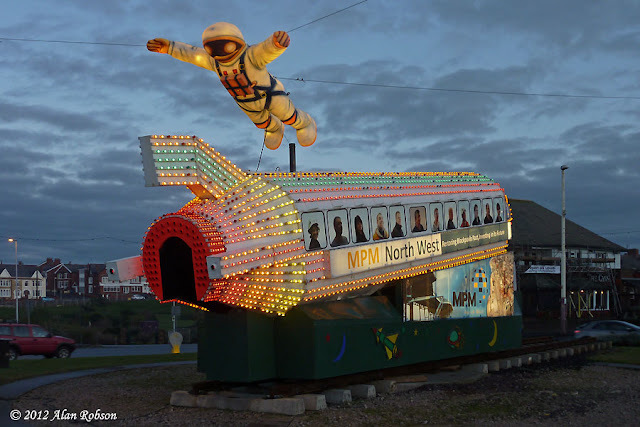 While the Rocket has been illuminated again in the weeks running up to Christmas, it is now beginning to look a bit ragged around the edges with many of its lights no longer working. 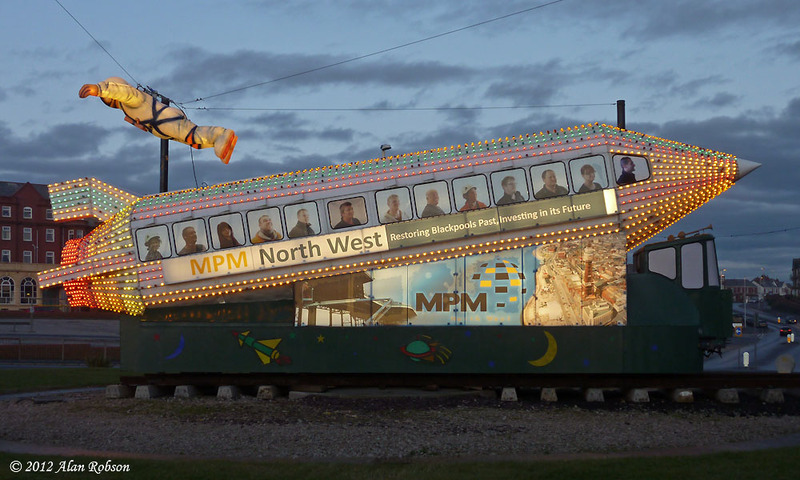 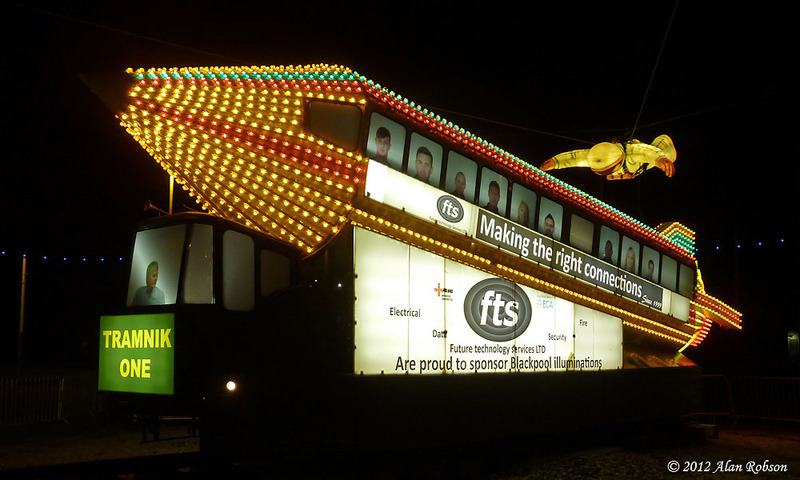 The tram looked pristine when it was first lit up for the illuminations, but the months it has spent on Gynn Square roundabout exposed to the elements have taken their toll on the lights, with the tram slowly fading away. 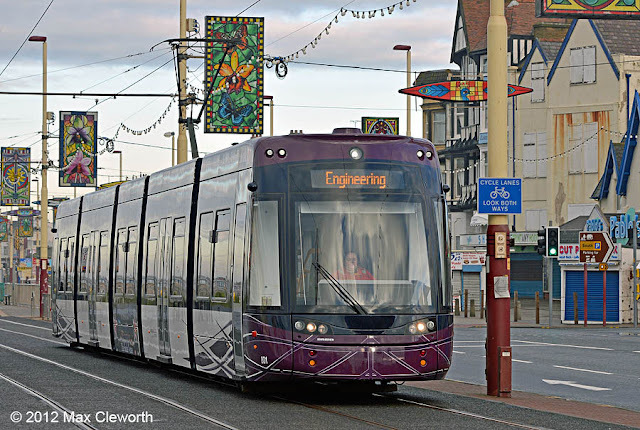 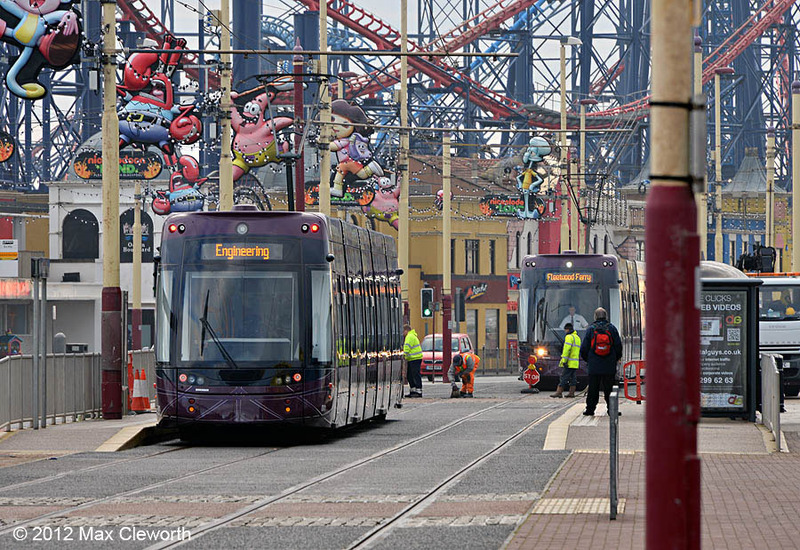 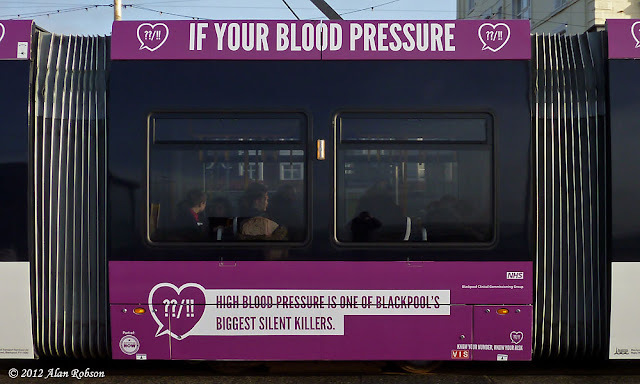 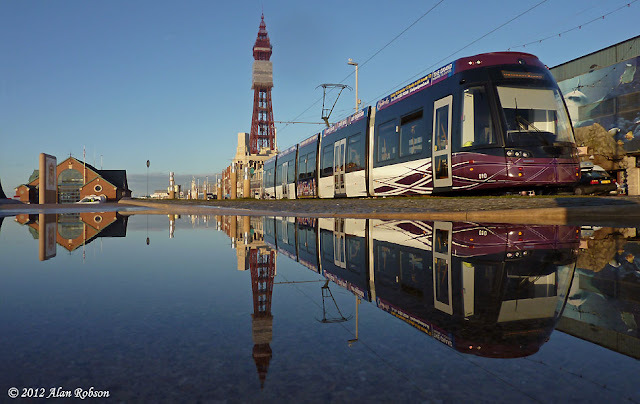 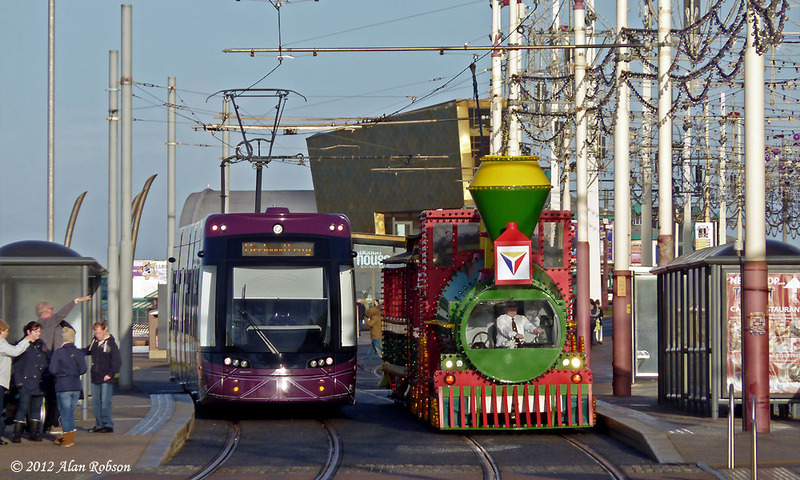 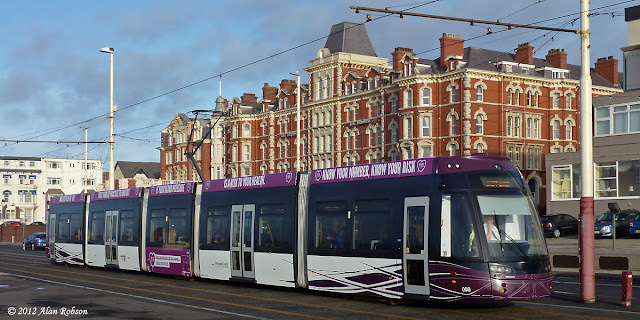 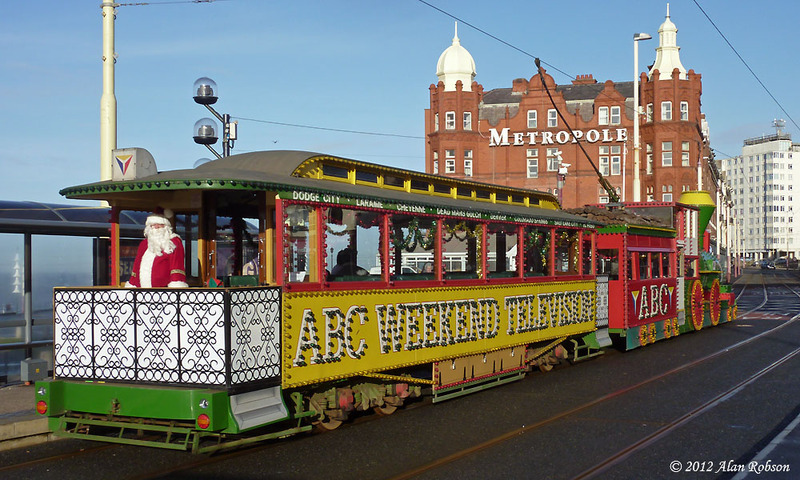 Flexity 008 entered service on Saturday 22nd December carrying a new National Health Service sponsored advert warning of the dangers of high blood pressure in Blackpool. 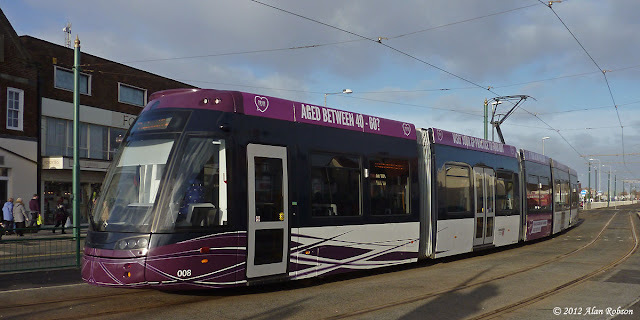 The advert is on one side of the tram only, and each of the five sections of the Flexity carries a different phrase, unlike many of the adverts that repeat the text over several sections of the tram. 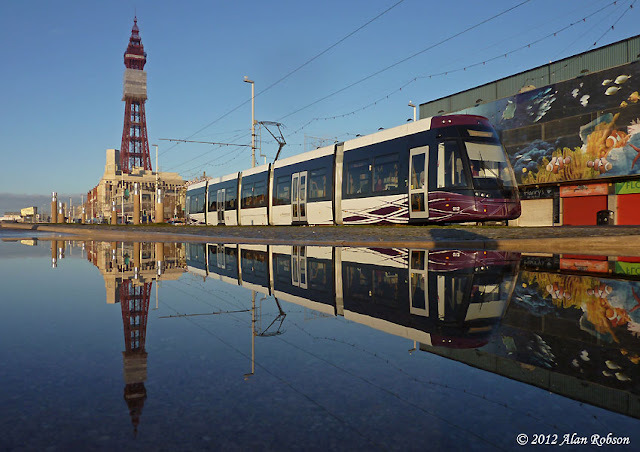 A combination of a large puddle, very little wind, wall-to-wall sunshine and no people, enabled these two shots of Flexity cars 010 and 012 to be taken with the Tower in the background on the afternoon of December 18th. 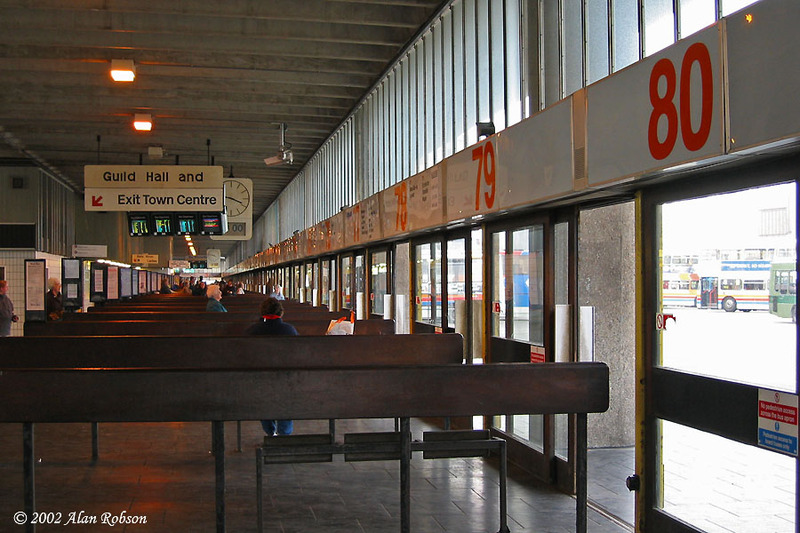 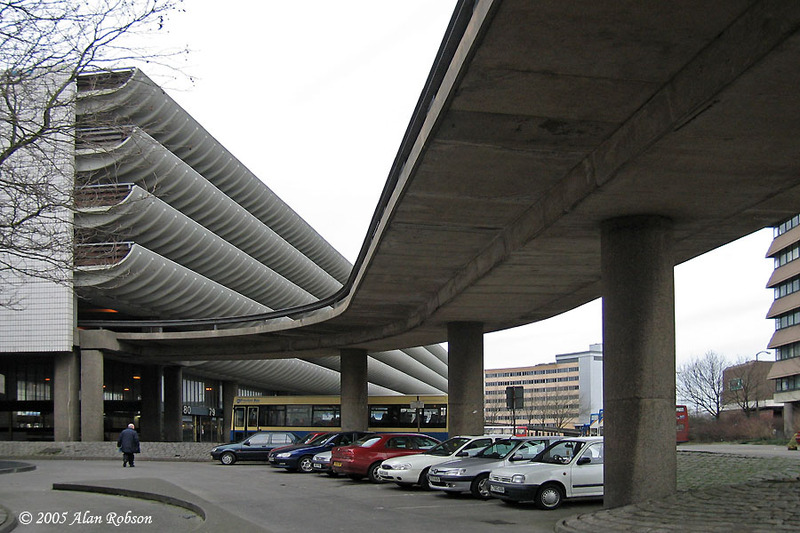 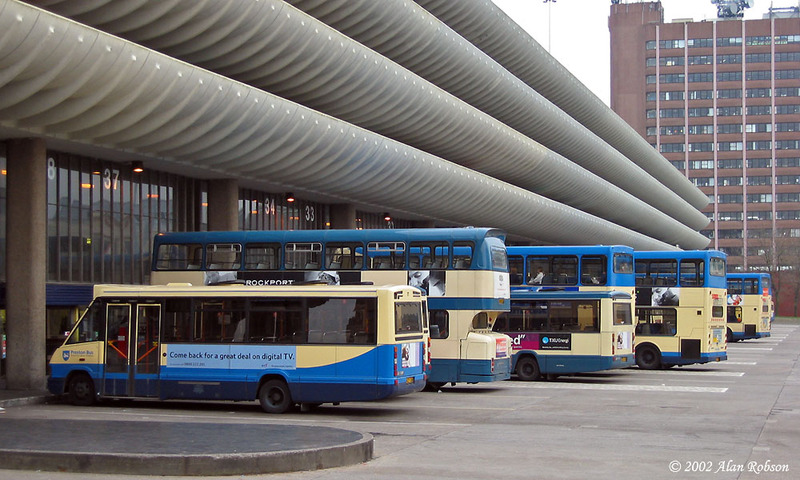 On the evening of Monday 17th December, Preston Council's Cabinet met to decide the future of the iconic bus station. 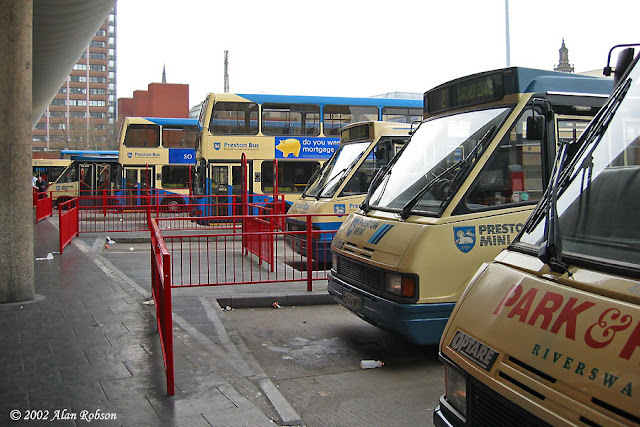 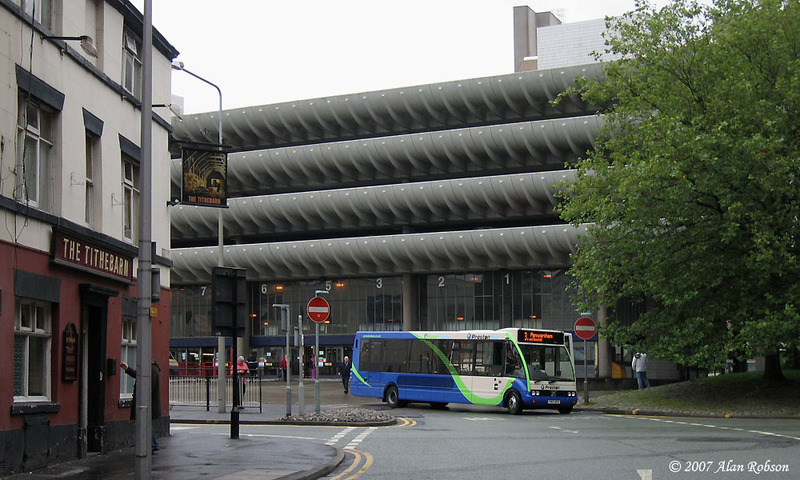 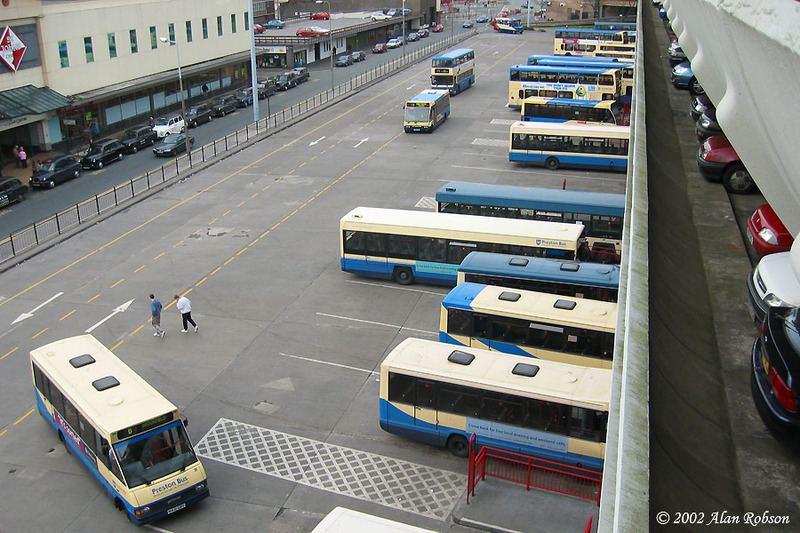 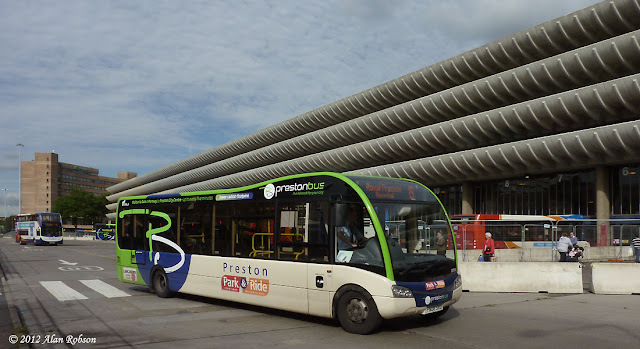 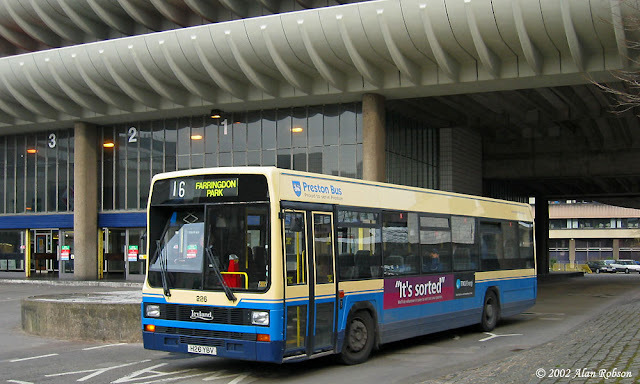 Preston City Council's Corporate Management Team recommended that the Cabinet agree "to demolish the Bus Station and Car Park and devise proposals to bring forward the site for development". 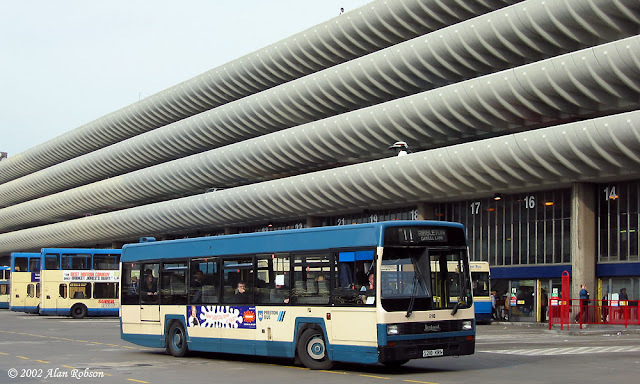 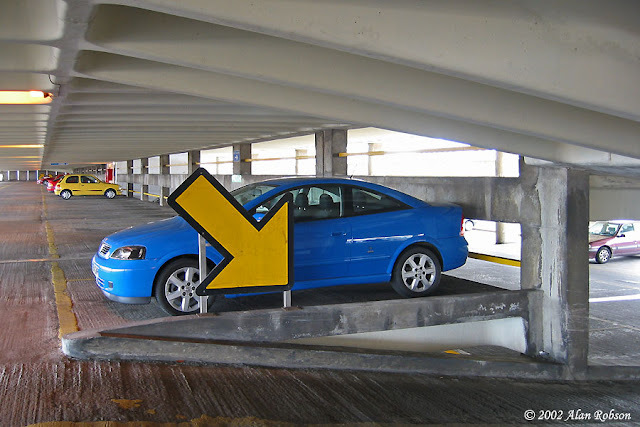 The Bus Station and Car Park was built in 1969 and is 560 feet long and nine storeys high, the Bus Station has 80 bays and the Car Park has 1100 car parking spaces. 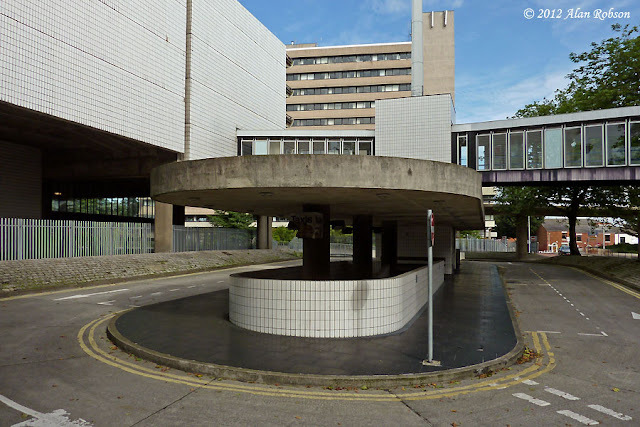 There has been a threat to demolish the Bus Station for several years, associated with the dead in the water Tithebarn Project. 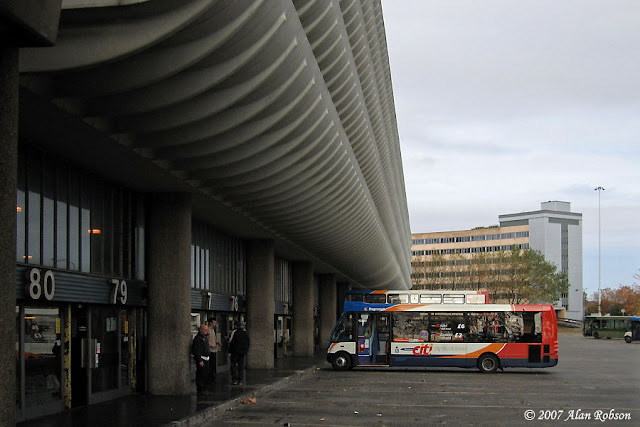 Despite the Tithebarn Project collapsing, the council seem determined to destroy one of Preston's most iconic buildings, the latest excuse being a lack of cash to maintain the structure. 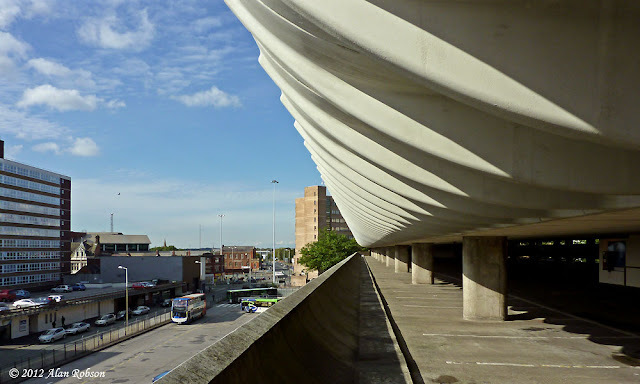 The figures seem to have been massaged in order to imply that it will be cheaper to demolish the whole building and construct a brand new smaller version, rather than maintaining and utilising the excellent facility that they already have in place. 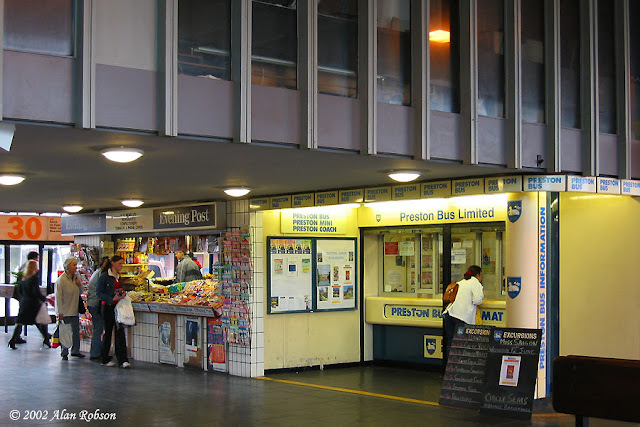 A Preston Council press statement on the demolition decision is available here:- http://www.preston.gov.uk/news/2012/dec/preston-bus-station-demolition-approved-principle/. 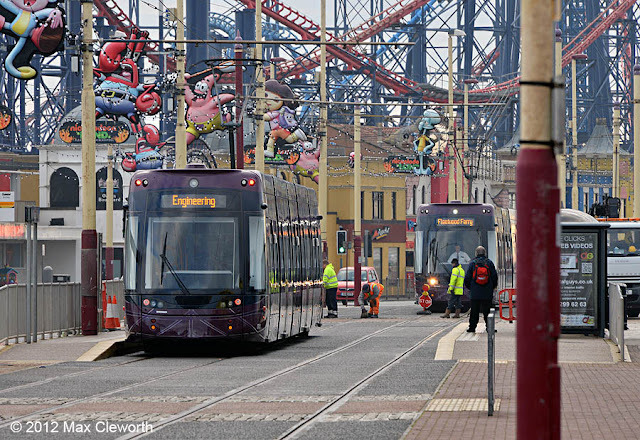 Flexity 001 approaching the Pleasure Beach displaying the unusual destination "Engineering"
Flexity 001 was spotted southbound at the Pleasure Beach on the morning of December 18th displaying the unusual wording "Engineering" on the destination screen. 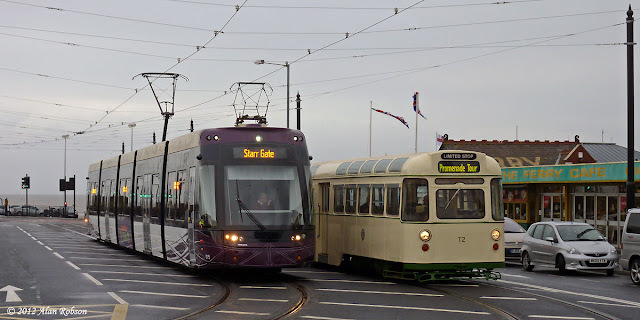 001 and a northbound service car were held up at the entrance to the turning loop as the points were being worked on (Photos courtesy of Max Cleworth). Balloon 700 returned to Rigby Road depot over the weekend, having spent several weeks in the new tram depot at Starr Gate in the company of Brush car 631. 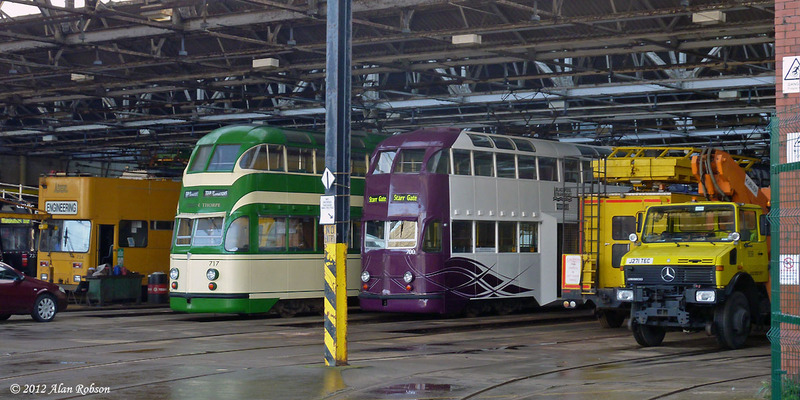 Note the new depot gate (open) which is just visible at the far right of the picture. The second weekend of the Santa Express saw very poor loadings again. The 10:00 run from the Pleasure beach was noted heading north with only a handful of passengers on board. 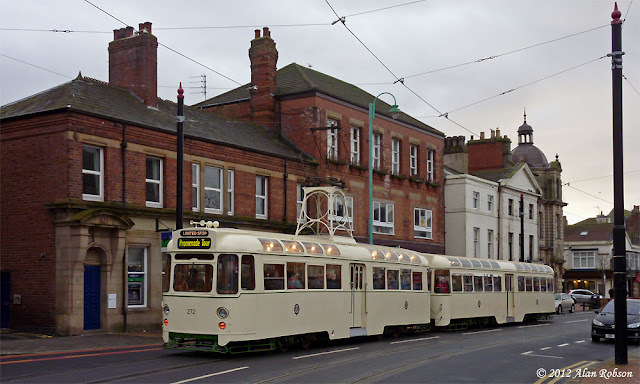 The second departure at 11:30 was rather more eventful, at some point on the return leg from Little Bispham the tram must have developed some problems, as it was noted at Bispham on the centre track with the Unimog in attendance. 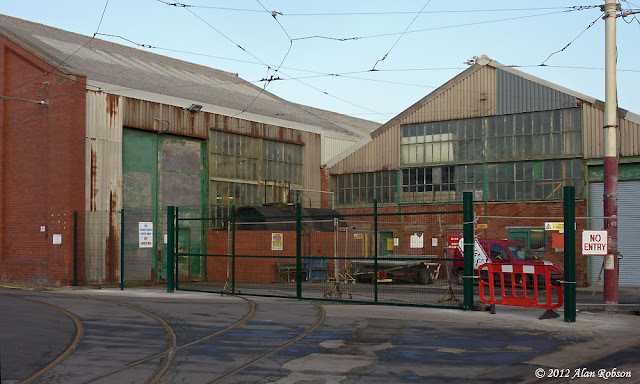 ﻿A month and a half after work commenced on building a new permanent fence across the front of Rigby Road tram depot, the gates are now starting to be fitted. On Thursday 13th December, new gates were noted in place across the fitting shop access track from Hopton Road. 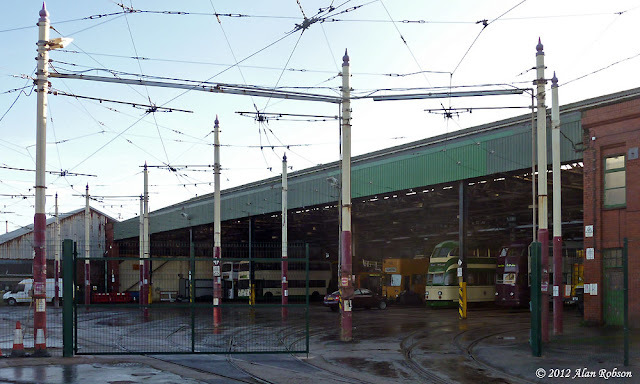 On a subsequent visit to the depot on Sunday 16th December, it was noted that both sets of gates are now in place in front of the tram depot, replacing the temporary fencing that has been there for some time. Flexity 002 was on driver training again on its second day of post commissioning use on Tuesday 11th December. 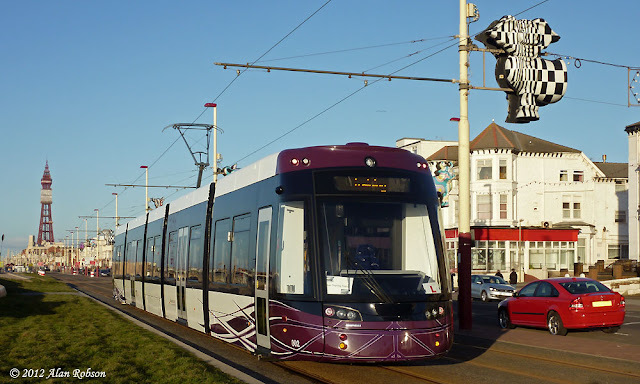 The only day that 002 has been used in passenger service so far this year was on the second day of Flexity operation on 5th April, 002 had been in use on driver training earlier that day, but was unexpectedly pressed into passenger service as an extra from Starr Gate to Bispham and return in the afternoon. 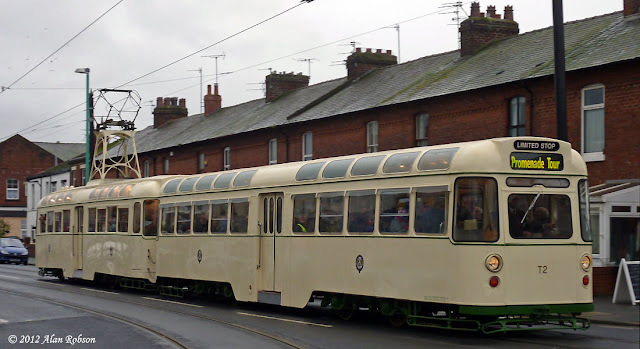 The photo below shows 002 on its only day of passenger use this year on the special to Bispham on 5th April, the tram was displaying the unusual destination "Bispham Station", although as usual the camera shutter has not fully captured the indicator display. 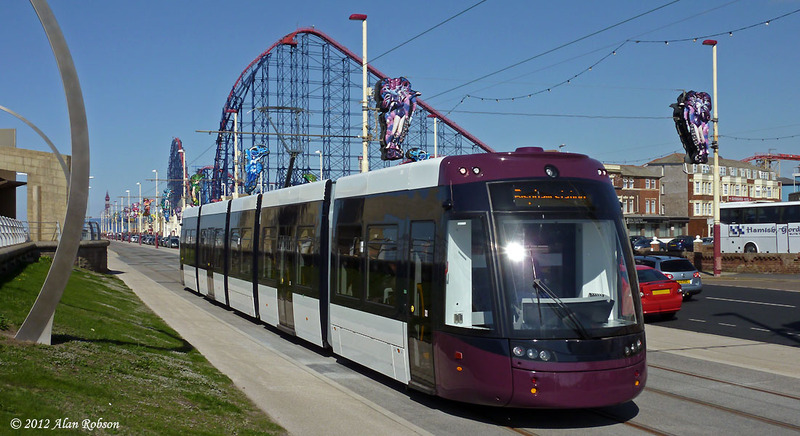 Flexity 002 is finally back in use again, over five weeks after it returned from Bombardier at Bautzen in Germany on 1st November, where it had been receiving upgrades and modifications. 002 was in use on driver training duties this afternoon, being noted as far north as Bispham, where it spent a while sat on the centre loop before returning south. 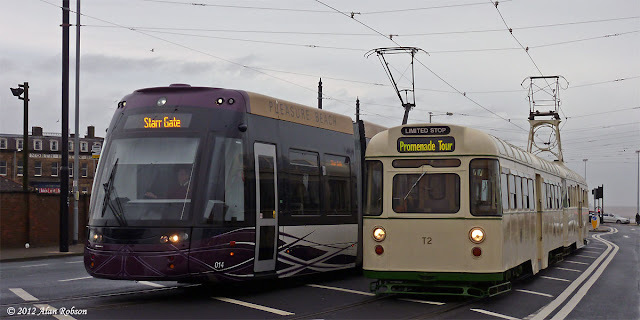 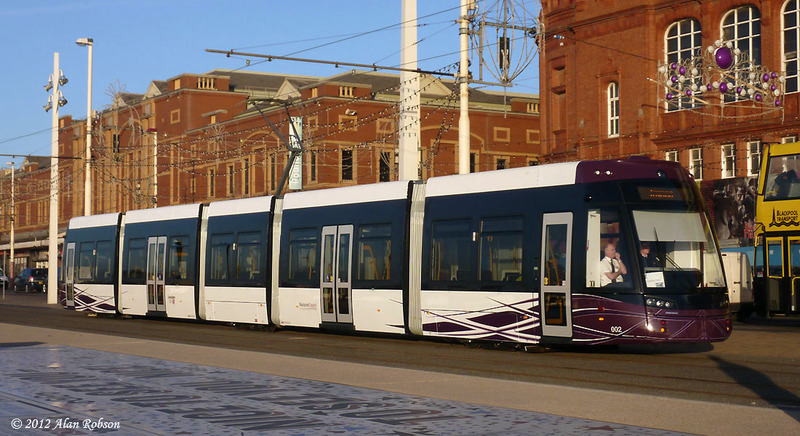 This is the first time that the tram has been used with its full vinyl branding and fleet numbers, as when 002 was sent back to Germany in May it was devoid of vinyls or numbering. 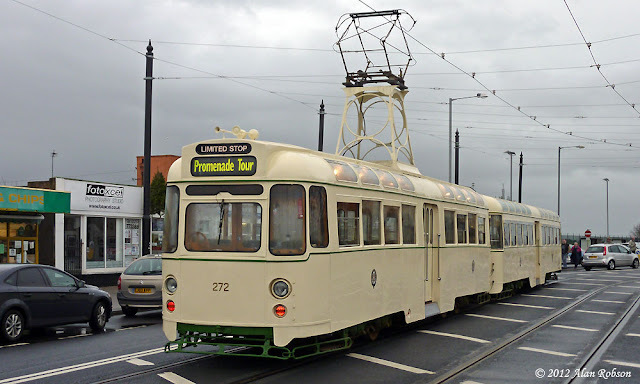 Hopefully now that the tram has been commissioned and is back in use, it won't be too long before it enters passenger service. 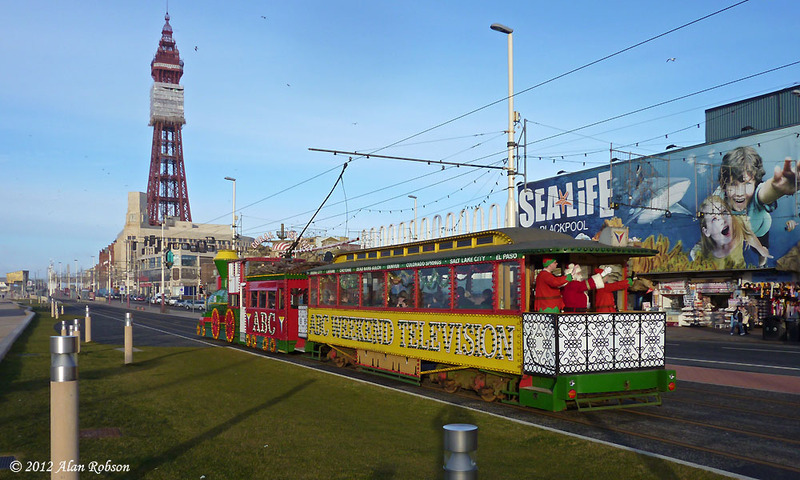 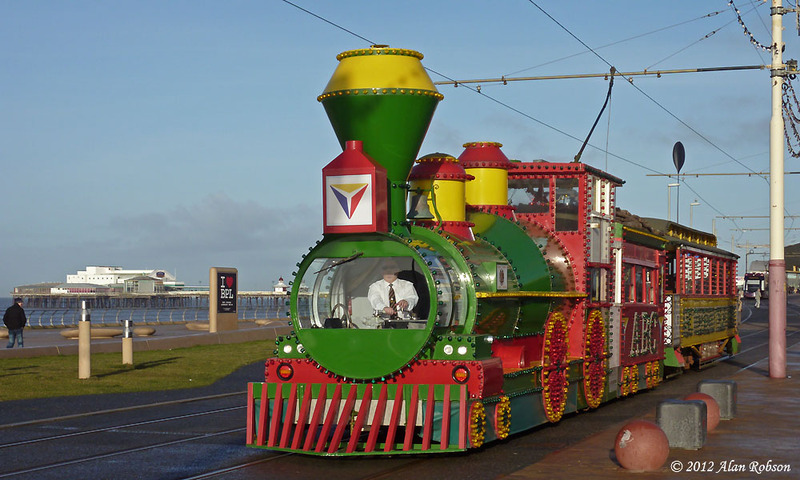 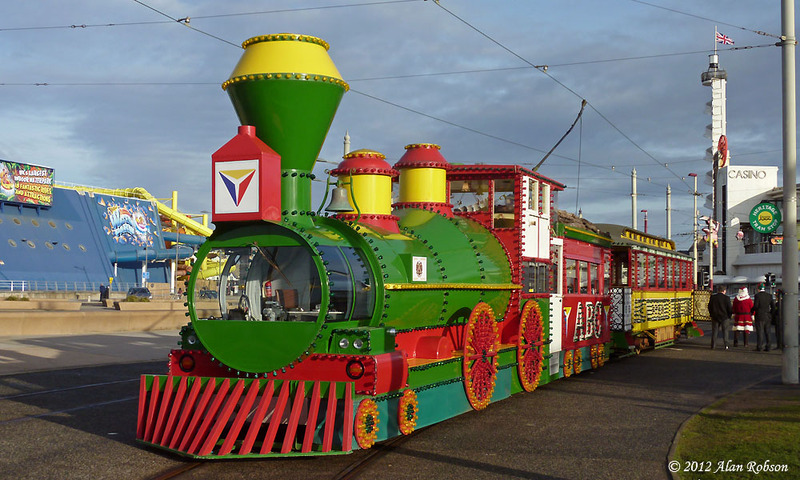 December 8th saw the first day of the Santa Express specials operated by Blackpool Transport, utilising the Western Train running from the Pleasure Beach to Little Bispham and return. The tours were timed to run at 10:00, 11:30 and 14:00. 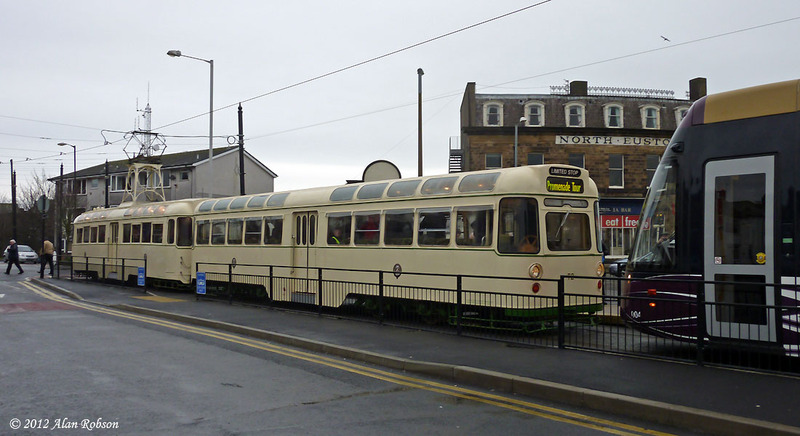 Unfortunately the day started with a bit of a whimper, with no passengers at all on the first journey! 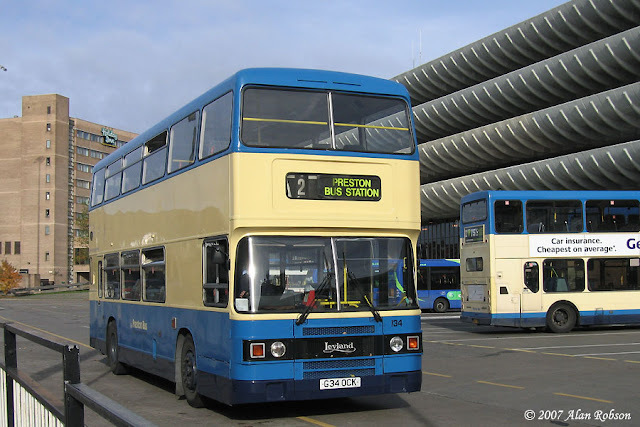 The 11:30 departure didn't fare much better either, only managing to attract one family on board. 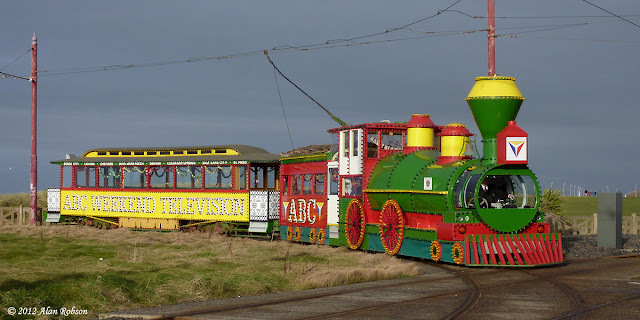 Perhaps the poor patronage was due to BTS insisting that the tickets be pre-booked, rather than people just turning up on the day. Despite the shortage of passengers, Santa and his elves took it all in good humour. Visit the Santa Express website at http://www.blackpooltransport.com/westerntrain.aspx for more information, if you would like to treat your children to a journey on the Western Train to see Santa. The Western Train turning round on Little Bispham loop during its second trip of the day, again with rather a light load!